Little is known about the incidence and symptomatology of pineal cysts in children. Until now, the proper management of this group of patients has not been established. 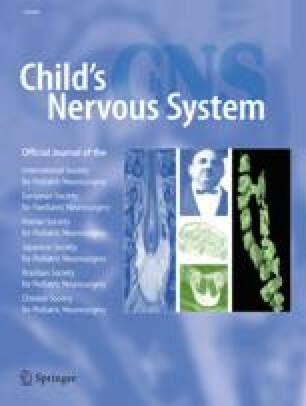 The purpose of this study was to evaluate the epidemiological and clinical features of pineal cysts in children and adolescents and to try to find guidelines for their management. We analyzed 24 patients (17 girls, mean age 9, and 7 boys, mean age 14) with pineal cysts found as the only pathology on MRI. Six patients were treated surgically (excision of the cysts via a supracerebellar-infratentorial approach) because of the progression of neurological symptoms or the enlargement of the cyst at follow-up. In this group of patients, no surgery-related complications were noted, nor was residual cyst observed on postoperative MRI. In 4 cases, histological examination revealed simple cysts, but in 2 cases pineocytomas were diagnosed. Preoperative symptoms disappeared except light headache in 2 cases and in 1 case no improvement was obtained. The remaining 18 patients had a mean follow-up of 38 months (range 24–60 months). None of the cysts diminished or collapsed. We also measured the circadian pattern of melatonin secretion as well as β-HCG and AFP levels in serum before surgery. We found very high night levels of melatonin in both of the patients with pineocytomas, while the patients with pineal cysts showed normal or depressed melatonin secretion profile. We concluded that though most pineal cysts were clinically benign they should be followed up for many years. If the cyst grows larger in follow-up MRI study and neurological symptoms are progressive, surgical treatment should be performed. In the authors' opinion, one of the markers discriminating benign and neoplastic lesions may be melatonin.